Edward implores you to enjoy the holidays. 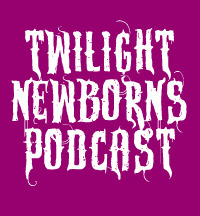 In episode 79, the Twilight Newborns celebrate Christmas and talk about ways the Cullens spend the holidays. Kristen Stewart is the new face of Chanel. See more at the LA Times. Kellan Lutz and Miley Cyrus are dating, maybe. See more at the Daily Mail. Kellan Lutz to star in upcoming Hercules movie. See more at EW.com. Robert Pattinson is spending the holidays in London. See more at US Weekly. Kristen and Rob planning to spend New Year’s together? See more at the Examiner.com. Classic SNL “D*ck in a Box”, just for fun. See more at Youtube. Love at First Bite: The Unofficial Twilight Cookbook by Gina Meyers. See more at the official website. 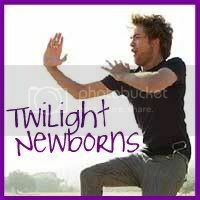 The Twilight Saga: The Complete Film Archive. See more at Amazon.com. Zombies Hate Stuff Wall Calendar. See more at Amazon.com. Kurt Cobain Action Figure. See more at Amazon.com. Who likes Christmas the best? 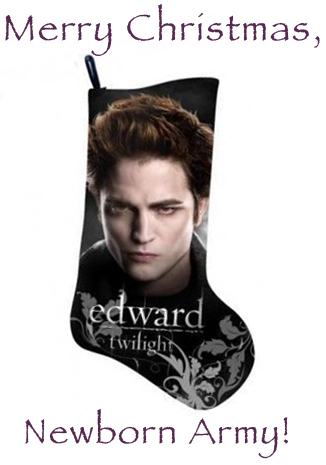 Where do the Cullens get holiday jobs? Who would make the best mall Santa?